The exuberant energy of Alain Pérez and his fourteen-piece band were by no means diminished by the small stage of Bar Sarao, one of Havana’s new private music venues. The phrase “solo en Cuba” (only in Cuba) certainly rang true in the case of what seemed an incredibly small space that accommodated a full-size tímba band, which gave an enigmatic and lively performance. Pérez opened the night with an explosive tímba in the early hours of what was a Wednesday morning (Tuesday night) when one would expect most Habaneros or even tourists to be asleep, preparing for the next day of work or sight-seeing. Instead, audiences were enthusiastic and engaged. Wealthy Cubans took front line, occupying tables close to the stage with minimum consumption value of $150 per table, and clearly demonstrating their personal aquitaine with Pérez. Behind, tourists were enjoying the music alongside $5 cocktails, looking largely unfamiliar with Pérez’s popularity and status as a musician. Well-dressed Cuban girls in their early twenties were seeking the attention of his musicians from the side of the stage. The VIP area in the upper level was almost emptied for the special guest of the night. Tight security escorted Pérez’s friend from his years living and working in Spain, jazz and flamenco singer Diego El Cigala. While mostly singing, half-way through the performance, Pérez took a base and tuned in with Cigala’s song Obsesión from his 2003 album Lágrimas Negras. The album was a collaboration between Cigala and the late Cuban pianist Bebo Valdes. In a flamenco and Cuban musical tradition, Cigala responded to the call and joined the performance on stage. He sang the original jazz version of the song, which Pérez took on and transformed into a tímba, while Cigala took over playing the bongos. Besides the virtuosity of the music, it is certainly only in Cuba that one can randomly visit a bar in the middle of the week week and get to witness some of the word’s most popular musicians performing alongside each other for an entry of $5. Ticket prices for Cigala’s concerts in New York are usually over $100. His only recent appearance in London in collaboration with Buena Vista Social Club diva Omara Portuondo was at $35 at the Barbican in 2016, where the stage clearly separated audiences from performers. Inundated with picture requests upon leaving the stage at Bar Sarao, Cigala posed with spectators before getting back to the VIP area. It was an exclusive experience. Alain Pérez, his band of some of Cuba’s most talented musicians, and Cigala. It was passionate, lively, spontaneous, what Cuban music and social life have traditionally been. Yet, other factors were also at play. Returned diaspora musical, Alain Pérez has become one of the leading figures of Cuban music in the past few years, shaping current trends through both his music and production company. His latest album ADN was nominated for the “Best Salsa Album” in the 2017 Latin Grammy Awards. Obsesión is not simply a song, but a monument of the cultural collaborations and influences between Cuba and Spain across different times. Cigala’s 2003 album bears the name of the cult bolero-son piece Lágrimas Negras composed in the 1920s, with lyrics and music by the Cuban composer and singer Miguel Matamoros. Hubo un Lugar from the same album is an ode to Cuba, and expression of Ciagala’s love and admiration for the island. At the same time his music is returning to Cuba and gaining new life through the work of Pérez, a diaspora musician who lived in Spain. 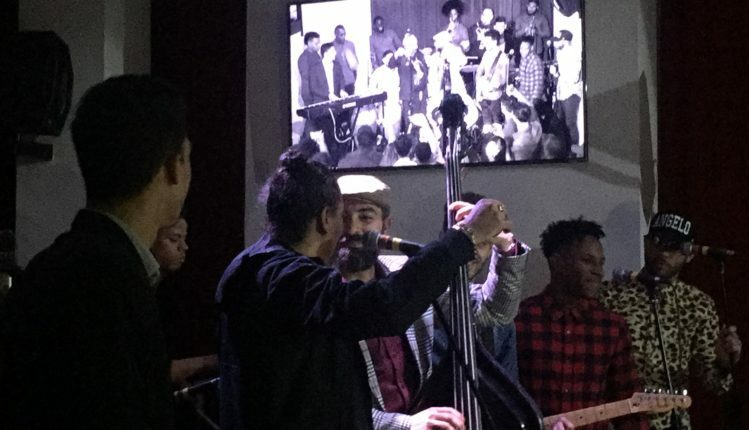 The original jazz version of Obsesión was performed by two of Pérez’s musicians a week earlier at an art exhibition at Bar Tatagua on Prado, where audiences sang along the instrumental. Towards the end of the evening Pérez was joined by another guest from he audience on stage, rumbero Barbarito Ramos from the leading Cuban rumba and folkloric group Los Muñequitos de Matanzas. Ramos was dancing the traditionally all-male style columbia. It is not uncommon for Cuban bands to play rumba towards the end of the evening, regardless of what music they were performing throughout the night. Interactivo usually close their events at Bar Sarao and Corner Café with rumba while opening up with American influenced jazz fusions. It is how Cuban parties in private homes or on the streets also happen. Ultimately, rumba is the foundation for salsa, timba, Latin jazz and improvisations, and an expression of the history, culture and traditions of Cuban society; and like Cuban parties, rumba music calls for dancing. Audiences received well beyond what we paid for. Foreign attendees had a unique experience, one only possible in Cuba: a personal proximity to artists at minimal prices, which is uncharacteristic for either North American or European live performances and events. Simultaneously, it is only a small proportion of the Cuban population who can afford to pay the $5 entry and to be out late on a Tuesday night. While the Cubans attending were spending more than what the few foreigners consumed, most Habaneros would have spent their evening at a very different social setting: behind closed doors or in public spaces such as the Malecon, the capital’s seaside esplanade and boulevard. Rich in contrasts Havana’s music sand social scene reflects the city’s polarities – wealth and poverty, private and public, foreign and local. It mirror’s the capital’s exuberant and full of uncertainty atmosphere. Cuban music like its musicians, travels around the world, influencing and being impacted by various international styles, and finally returns home. In the same manner diaspora musicians return to create in Cuba, because in Perez’s words there is certain creativity and energy that is unique to the island. Prev Post Deathless: "They Tried to Bury Us but They Didn't Know We Were Seeds"